The new boundary stone inscription located by the Gezer survey team this season is the first to be found in over a decade, increasing the total number of known Gezer boundary inscriptions to 13. The new inscription is very weathered and is a bilingual inscription like many of the others, with some minor differences. It is a three line inscription, rather than the typical two, with the Greek name Alkiou on the first line (literally “belonging to Alkios”), remnants of the Hebrew word for “region of” on the second line and small remnants of the letters spelling “Gezer” on the third line. The Greek letters are larger than in other inscriptions and both the Greek and Hebrew lines are oriented in the same perspective. The survey directors will seek to publish the inscription as soon as possible in an academic publication. The second inscription discovered this season has not been seen by scholars in over 100 years. Originally discovered by a 19th century French explorer, a later excavator RAS Macalister admitted to having spent considerable time during his 1902 through 1909 expeditions searching for this particular boundary stone. Unable to find the inscription, he concluded that it must have been defaced to unintelligibility in the years subsequent to its discovery. Based on a published field sketch of the stone, this boundary inscription and the 19th century discovery are one and the same. The full story is here. Sam Wolff, who mentioned this report on the ANE-2 list, writes that the two inscriptions are 50 meters apart. When Ronny Reich discovered inscription #12 about a decade ago, he and Zvi Greenhut published a survey of all the inscriptions, with GPS coordinates, in Israel Exploration Journal 52/1 (2002): 58-63. The SWBTS article states that survey directors Eric Mitchell and Jason Zan have written an article on the first five survey seasons to be published soon by Hadashot Arkheologiyot. See this month’s issue of the BiblePlaces Newsletter for a photo of inscription #8. Gezer boundary inscription #12 (source). Bottom line reads “of Alkios” (in Greek); top line reads (from the other side, in Aramaic) “the boundary of Gezer” (taham gezer). Stephen Gabriel Rosenberg reviews significant discoveries in his Archaeology in Israel Update—April 2012. The Washington Post has a good slideshow of the gold hoard from Megiddo. Wayne Stiles considers the difference between the “reunification” of Jerusalem and the “restoration” that the Bible predicts. The Good Book Blog has an infographic depicting the Rulers of Israel and Judah. Sensation Before Scholarship: Gordon Govier writes in Christianity Today about the problem of media hype in archaeological and textual discoveries. The ASOR Blog has a new Archaeology Weekly Roundup. Eisenbrauns has announced their 2012 Mug. Evidence for April 3, 33 CE Crucifixion Earthquake? To analyze earthquake activity in the region, geologist Jefferson Williams of Supersonic Geophysical and colleagues Markus Schwab and Achim Brauer of the German Research Center for Geosciences studied three cores from the beach of the Ein Gedi Spa adjacent to the Dead Sea. Varves, which are annual layers of deposition in the sediments, reveal that at least two major earthquakes affected the core: a widespread earthquake in 31 B.C. and an early first century seismic event that happened sometime between 26 A.D. and 36 A.D. In terms of the earthquake data alone, Williams and his team acknowledge that the seismic activity associated with the crucifixion could refer to “an earthquake that occurred sometime before or after the crucifixion and was in effect ‘borrowed’ by the author of the Gospel of Matthew, and a local earthquake between 26 and 36 A.D. that was sufficiently energetic to deform the sediments of Ein Gedi but not energetic enough to produce a still extant and extra-biblical historical record.” If the last possibility is true, this would mean that the report of an earthquake in the Gospel of Matthew is a type of allegory,” they write.Williams is studying yet another possible natural happening associated with the crucifixion - darkness. Three of the four canonical gospels report darkness from noon to 3 PM after the crucifixion. Such darkness could have been caused by a dust storm, he believes. Williams is investigating if there are dust storm deposits in the sediments coincident with the early first century Jerusalem region earthquake. Geologist Jeff Williams has sent me an email clarifying his team's findings and subsequent interpretations. I have reproduced his clarifications and personal input with his permission below. Based on his response which expresses a strong desire to maintain objectivity, it is my feeling that this is not a case that should be lumped into the growing sensationalistic pseudo-archaeological, pseudo-scientific "discoveries" related to Jesus. You can also check out some more of there research here. An early first century earthquake shows up in the Dead Sea sediments for which the historical record (that we know of) shows no plausible candidates. However, there is mention of this earthquake in the New Testament. In fact, we added no new information about the date of the crucifixion. We took previous work by other authors largely based on astronomical calculations pertaining to the Jewish Lunar Calendar which assigned a range of likely dates for the crucifixion and compared them with our geologic estimate of the age of the earthquake; which was dated to have occurred between 26 and 36 AD. We also performed a geomechanical analysis to examine all historically reported earthquakes within a 40 year time span around 30 AD to see if it was likely that any of them would have deformed the sediments. None appeared to be likely candidates. Then we made some conclusions which are listed in the abstract of our article. Finally, I think I should explain who I am and what I am about. I am first and foremost a scientist. I am also agnostic. I assume the New Testament is a human document that contains errors. I am not trying to prove or disprove the Bible. I am treating the statement by Matthew that there was an earthquake on the day of the crucifixion as a hypothesis that needs to be tested. I will publish whatever I can coax out of the sediments; whether this supports or contradicts biblical accounts. I have much respect for people of faith but I personally do not rely on faith. I am naturally curious and don’t know what the end result will be of the research I am undertaking. An article this week at The Christian Century doesn’t break any new ground on the political dimensions of the excavations in the City of David, but for those looking for an introduction to the subject, this is an easy place to begin. The Israelis have continued to dig all around Jerusalem, while the Palestinians have tried to stop digs that they see as infringements on their sacred territory. In the 1990s, Muslims undertook their own dig on the southeast corner of the Temple Mount as part of providing new access to the Marwani Mosque (also known as Solomon’s Stables). The dig was criticized by Israelis for taking place without the proper archaeological supervision, and some Israeli archaeologists charged that the Muslim excavators hid evidence of ancient Jewish presence at the site. Recently, attention has been focused on a site known as the City of David, which lies just south of Jerusalem’s Old City. Archaeologists are exploring a site on and around the stream of Gihon, a site associated with the origins of the city. Jerusalem, like so many cities, was founded on or near a water source. The article has a few basic mistakes, and each side will disagree with parts of the presentation, but as an introduction to the subject, it serves its purpose. There may be a record number of excavations this summer, and I’ve taken the list at the Israel Ministry of Foreign Affairs site and supplemented it with sites listed at Biblical Archaeology Society and a few others. Particularly popular regions are the Shephelah with 7 digs (Gezer, Tel Burna, Khirbet Qeiyafa, Tel 'Eton, Tell es-Safi/Gath, Socoh, and Azekah) and the Huleh Basin with 4 digs (Omrit, Abel Beth Maacah, Dan, and Hazor). If you prefer to work near the ocean, you have 5 options (Tel Achziv, Ashkelon, Jaffa, Tel Akko, Apollonia-Arsuf) and 4 more if you want to be close to the Sea of Galilee (Bethsaida, Tiberias, Tel Bet Yerah, and Hippos). The excavations are listed in the chronological order from the starting date. In addition, excavations are on-going at Magdala, Maresha/Bet Guvrin, Jerusalem, and other sites with salvage digs under the Israel Antiquities Authority. The Israel Antiquities Authority announced today the discovery of a seal impression with the name of Bethlehem. The first ancient artifact constituting tangible evidence of the existence of the city of Bethlehem, which is mentioned in the Bible, was recently discovered in Jerusalem. A bulla measuring c. 1.5 cm was found during the sifting of soil removed from archaeological excavations the Israel Antiquities Authority is carrying out in the City of David. The sifting is underwritten by the 'Ir David Foundation' in a project being conducted in the Emek Tzurim National Park. A bulla is a piece of clay that was used for sealing a document or object. The bulla was impressed with the seal of the person who sent the document or object, and its integrity was evidence the document or object was not opened by anyone unauthorized to do so. According to Eli Shukron, director of the excavation on behalf of the Israel Antiquities Authority, “it seems that in the seventh year of the reign of a king (it is unclear if the king referred to here is Hezekiah, Manasseh or Josiah), a shipment was dispatched from Bethlehem to the king in Jerusalem. The bulla we found belongs to the group of “fiscal” bullae – administrative bullae used to seal tax shipments remitted to the taxation system of the Kingdom of Judah in the late eighth and seventh centuries BCE. The tax could have been paid in the form of silver or agricultural produce such as wine or wheat”. Shukron emphasizes, “this is the first time the name Bethlehem appears outside the Bible, in an inscription from the First Temple period, which proves that Bethlehem was indeed a city in the Kingdom of Judah, and possibly also in earlier periods”. Too much can be made from this discovery, especially with the emphasis of the last sentence above. The existence of Bethlehem in the period of the Old Testament is not disputed, and an inscription this late is not as helpful as one would be from the time of Ruth or David. Nonetheless, it is a nice discovery which adds another piece of data to our understanding of the Judean kingdom. The closest biblical connection that one can make to this time period (late 8th or 7th century) is the prophet Micah, who derided the failed leadership of his day (chapter 3), predicted a restored Davidic kingdom (chapter 4), and expected that Bethlehem would produce the awaited king, one whose origins are from ancient times and who would “be their peace” (chapter 5). The full press release is here and a high-resolution photo is here (also below). The story is reported by the Jerusalem Post, Reuters, the Associated Press, and many others. Photograph by Clara Amit, courtesy of the Israel Antiquities Authority. We first noted this discovery in March, but more details are available now that the media has picked up the story. From the Jerusalem Post. The Megiddo cache is notable for its abundance of gold jewels, including nine large earrings and a ring-seal. It also includes than a thousand small beads of gold, silver and carnelian – a semi-precious stone of orange-to-amber hue. All of the artifacts are in good condition. One of the collection's most remarkable items is a gold basket-shaped earring bearing the figure of a bird, possibly an ostrich. Experts believe one of the items may be the first of its kind ever discovered in Israel, and that its use of gold points to possible Egyptian influence. Megiddo, the Armageddon of Christian Scripture, was for centuries a major trading post on the Egypt-Assyria trade route. So far 25 Iron Age jewelry hoards have been uncovered in Israel, with most of them containing only silver artifacts. "The hoard includes a lot of gold items, which have origins in Egypt," said Eran Arie, a Tel Aviv University archeologist who was supervising the dig at the time of the jewels' discovery. The full story is here. More photos of the Iron I objects are posted at the Megiddo website. Last night I was reading an interview with Cyrus Gordon, who made an interesting comment about the discovery of gold in the land of Israel. I also went to see [W. M. Flinders] Petrie at Tell el-Ajjul, which he thought was ancient Gaza. He was wrong, but he found more gold in that one year than archaeologists have found in the past hundred years in every site combined (Scholars on the Record, p. 163). Petrie worked at Tell el-Ajjul from 1930 to 1934; the interview with Gordon was first published in BAR Nov/Dec 2000. A Byzantine olive press has been discovered in Modi’in. The Dead Sea Scrolls exhibit that was on display at Discovery Times Square in New York City has moved to the Franklin Institute in Philadelphia where it will remain until October 14. The ASOR Blog reviews the broader world in their Archaeology Weekly Roundup. Following on from the success of 2011, we are happy to announce that this year’s Day of Archaeology is scheduled for June 29, 2012! Last year’s event brought out 400+ archaeologists, and almost 450 separate posts including lots of photos, video, audio and more. You can read more about the Day of Archaeology at About the Project, but the general hope is that by raising awareness about the truly diverse nature of archaeology, we will also in turn emphasize the vital role that archaeology plays in preserving our past for everyone’s future. We want anyone with a personal, professional or voluntary interest in archaeology to get involved, and help show the world why archaeology is vital to protect the past and inform our futures. Sounds interesting. You can check out the website here. You can read entries from last year here. The traditional names for the massive quarry underneath the northern part of Jerusalem’s Old City are likely incorrect. Nadav Shragai reports on the cave, its likely origin in the time of King Herod, and its significance for Freemasons over the last 150 years. Since that time, the Freemasons in Jerusalem have been unable to return to the Temple Mount. The alternative has been Zedekiah's Cave, just a short distance from Damascus Gate. This huge chalky cave, which has always been shrouded by mystery, stretches across 9,000 square meters underneath the Muslim Quarter of Jerusalem's Old City and continues until the Via Dolorosa in the Christian Quarter just north of the Temple Mount. A number of historical sources claim that the cave continues southward to the Temple Mount area, yet we now know that these claims have no basis in fact. A mapping of the cave undertaken by the Israel Antiquities Authority in recent years debunks this theory. Ancient traditional beliefs that posit the cave – which eventually became a giant quarry – was source for stones that were used in the construction of Solomon's Temple also do not square with the facts. (In English, the cave is known as King Solomon's Quarries.) There is no indisputable archaeological evidence that traces quarrying activity in the cave back to the days of the First Temple. It has been widely believed that Zedekiah, the king of Judea, fled the Babylonians through the cave. Still, Dr. Yechiel Zelinger, the IAA's excavation director, who led the exploratory digging of the cave in recent years, reveals that a great deal of evidence indicates traces from the Second Temple period. This has led experts to the more likely possibility that the cave was one of the primary sources of stone utilized by Herod the Great when he built the temple 2,000 years ago. This assessment is based on findings that indicate hallmarks of the style of quarrying acceptable in those times. These hallmarks are evident on the cave walls as well as in the stones, whose size is characteristic of the stones that made up the walls surrounding the Temple Mount. Another factor was the cave's proximity to the Temple Mount as well as its relatively higher altitude compared to the mount, which suggests that it was easier to move the stones. This theory rests on more solid footing than the fairy tale linking the area to Solomon's Temple. Before my recent travels, I teased that upon my return there would be a major announcement here. I believe I used a superlative to describe its significance. If you were hoping for some amazing archaeological discovery, or some conclusive evidence against an alleged archaeological discovery, that’s not what I was hinting at. Surely I would not be the only one with such knowledge, in any case. This new photo collection is “the most important announcement in the history of this blog” because it is the foremost achievement in our many years of research, teaching, and photography. We have been working on this particular project longer than we have been blogging. The Revised and Expanded edition of the Pictorial Library of Bible Lands is superior to anything we have ever created. While the previous edition of the Pictorial Library (published in 2003) was well received, this new edition has been the focus of our labors (outside the classroom) for the last nine years—more than double the time we spent developing all previous editions of the collection. Length of time does not make a project great, and users will have to decide whether the collection is as valuable as we believe, but the scope and depth of the Pictorial Library is remarkable. We do not know of any collection that covers as much ground as this one. We believe that the quality of the photos is high. The winning combination is the availability of high-quality photos of biblical sites, scenes, and objects for pennies per photo. Furthermore, we believe that “pennies for photo” is the best possible price. Paying $50-$100 per photo is impossible for most Bible teachers and students. Getting photos for free often comes with a catch, a condition, or a hassle. Our photo collection comes with broad rights and no hassles. You can see what’s new here, read about the contents of all 18 volumes here, check out the free photos here, find answers about the discount for upgraders here, and place an order here. If you believe that this is a valuable collection, we’d be delighted if you’d tell your friends, teachers, students, and co-laborers in the ministry. A new museum in Tel Aviv – the Beit David Museum, dedicated to the House of David – offers two fun-filled free days honoring the holiday of Shavuot, which is also celebrated as the 3,025th birthday of greatest Jewish king ever. The museum, located on 5 Brenner St. in central Tel Aviv, opened just four months ago. It contains archeological exhibits from First and Second Temple times and includes artifacts of special significance in the story of King David: for instance, one section displays slingshot stones found in the Emek HaEla [Valley of Elah] region, where David killed Goliath with a single accurate stone to the head. The museum prides itself on the Genealogy Center, a database that traces the descendants of King David to this very day. The museum seems to have some interesting material, but I’m surprised they chose Tel Aviv for its location. The full story is here. It was a beautiful, partially cloudy spring day in Jerusalem on Tuesday, with temperatures reaching 25 degrees Celsius in the shade. A perfect day for strolling around nearly any part of the city, with one truly glaring exception: the Western Wall Plaza. The glaring whiteness of the plaza pavement reflected the heat, and the complete absence of trees, buildings and pergolas ensured that there was not a speck of shade. The result is an almost unbearable experience for worshipers and tourists who congregate at Judaism's holiest site. The situation will only become worse with the arrival of summer. "I was at a bar mitzvah on the eve of Passover, which isn't yet summer, and people said it was impossible to concentrate on the prayers," recalls Ofer Cohen, chairman of an NGO, called the Lobby for Jewish Values. "Anyone who prays when it is hot has to finish the prayer quickly - it isn't praying with a focused mind," says Cohen, who has asked the ministers of tourism and religious affairs to try to solve the problem. Tour guides are also irked by the harsh conditions at the plaza. "The problem exists all year around, both in the rain and in the sun," says Jerusalem guide Ben Lev Kadesh. "In this whole huge space there isn't a single covered corner. Many of the tourists come from Europe and it isn't easy for them to stand in the sun." Indeed all ideas for providing some kind of cover or shade in parts of the plaza have been rejected. The problem has been under discussion for decades, say officials in Rabinovitch's office. "There have been discussions about how to deal with heat in summer and rain in winter. But most people from the areas of planning, history and archaeology have felt strongly that for the sake of the Wall's splendor, glory, and the memory of the past, the Western Wall should be revealed without means of shading," say the officials. Matthew Kalman reports on the sentencing hearing this week for Oded Golan, convicted of three minor charges in connection with the James Ossuary case. The Antiquities Authority, backed by State Attorney Moshe Lador, has launched a desperate rearguard action to reverse its humiliating defeat in a seven-year trial that ended with the acquittal of an Israeli collector accused of faking the burial box of [James] the brother of Jesus and an inscribed stone [Jehoash] tablet that may have hung on the wall of Solomon’s Temple in Jerusalem. The latest twist came during a routine sentencing hearing at the Jerusalem District Court last Tuesday, two months after the stunning collapse of the high-profile prosecution. Prosecutor Dan Bahat revealed that the Antiquities Authority was determined not to return dozens of items, including the burial box and the stone tablet to their owner, despite his acquittal on all the relevant charges. Bahat compared it to returning drugs to a dealer acquitted on a technicality. The rest of the article indicates that the IAA is playing the role of the sore loser but the judge isn’t falling for their dirty tricks. A lot has been written about the recent announcement of two portable shrines discovered at Khirbet Qeiyafa. I might draw your attention to a small portion of what has been written in the last two days. To get a better sense of just what is depicted on the shrines, start with the captions on Luke Chandler’s post. Luke also addresses the question of whether the shrines are “aniconic,” though as discussion in the comments there indicate it seems best to recognize that while the shrines have depictions of animals, this does not necessarily violate the biblical command against worshipping images. When you see similar shrines such as those posted by Tom Verenna and Owen Chesnut, the uniqueness of these discoveries is certainly diminished. James McGrath provides a lengthy list of links. Finally, it may be worth observing that much of the present discussion concerns the sensational interpretation of the objects and that if the excavators did not promote theories without sufficient evidence these discoveries would be like all the others—described in excavation reports and unknown to most. The question, then, is whether increased publicity is worth inflated or inaccurate claims. Recent construction in the Jerusalem neighborhood Rehavia, may have revealed the site of this miraculous quarry. Under the foundations of an old building demolished to make room for new construction a large stone chiseled in the shape of a column. Upon discovery of the column, the Israel Antiquities Authority halted the construction project and began studying the find, which is 20 ft (6 m) tall and 30 in (80 cm) wide. These proportions correspond to building practices of the period. The site had no other finds that could be used to time the column but Evgeny Kagan of the Antiquities Authority, believes that it is from the Byzantine period based of the stone type and the methods used by the stonemasons. The stone bares the Arabic name "Mizi Achmar," meaning red stone, which could correspond to the "flames of fire" described by Procopius. This kind of stone is considered very difficult to work with. According to Prof. Yoram Zafrir it was hardly used until the introduction of explosives in the 19th Century, except during the Byzantine era. The builders of the Jerusalem Temple for example used a softer stone. The full story gives a Byzantine account of the provision of giant red stones. A high-resolution image is viewable here. Studying historical geography, in my own experience, has permanently marked my life and changed the way I understand the Bible. Places and names, which I used to pass over, now immediately bring to mind a site’s history, its geographical pros and cons, its scenery, and even its smells. Having knowledge of a passage’s geography gives me a head start as I attempt to understand why events took place—sometimes repeatedly—in certain locations. My experience is not unique. I have conducted and videotaped a number of interviews with those who have both studied geography and also been to Israel. Their testimonies illustrate the importance of understanding and experiencing historical geography—not just from a knowledge-based perspective but also as it benefits one’s spiritual life. My research revealed that those who understand and experience historical geography enjoy a sharper comprehension of the Bible, a clearer direction to its application, and a more effective communication of truth. The study of historical geography provides a greater confidence in the Bible as God’s Word and instills a greater love for the God of the Bible. Those who study geography, coupled with time in the land, experience an even greater benefit than those who simply read books. Read the whole thing. The research to which Stiles refers is available here. A local imitation of an Athenian tetradrachma was discovered on the surface of Tel Azekah recently. Excavations begin at the site in July. The Egyptian government has announced that “a big archaeological slab dating back to the era of Ramesses III” was found at the Karnak Temple. Wayne Stiles: “Perhaps because of the atrocities of Manasseh, Jesus used the Hinnom Valley as an illustration of eternal torment (Matthew 18:9).” Stiles compares the redemption of the evil king with the transformation of the valley today. Ferrell Jenkins is posting photos of his current tour in western Turkey and Greece, including Smyrna, Pergamum, and more. I like the photo of the Hidden Waterfall at En Gedi now posted at The Bible and Interpretation. Aren Maeir was interviewed on the LandMinds program (part 1, part 2, part 3, part 4). As a follow-up to the recent post on Esther in the Dead Sea Scrolls, it may be noted that only 1 manuscript (4Q118) with 4 complete words is preserved of the much longer 1-2 Chronicles (ABD 1:995). The Samaritans celebrated Passover on Mount Gerizim yesterday. Because the holiday fell on Shabbat, the sacrifice was held at noon, making photography a bit easier. The ceremony was previewed by Gil Zohar in the Jerusalem Post. Israel Hayom has side-by-side photos of the new Mattaniah seal with a seal impression. Luke Chandler expects that Yosef Garfinkel’s press conference next week will be about cultic finds from the 11th-10th centuries at Khirbet Qeiyafa. Aren Maeir has heard that the announcement will be “very special” and he makes a few guesses. Archaeologists have now found five ritual baths in the “caves of refuge” in the Arbel cliffs. I was at the Israel Museum a few days too early and entrance to a display of the earliest coins ever minted was blocked. Featuring 500 coins from two private collections, the “White Gold” exhibit opens on Tuesday and continues through March 2013. Shmuel Browns reports, with photos, on the destruction of a mosaic floor in a monastery near the Elah Valley. A photo showing graffiti painted by the vandals is posted at Ynet News. It’s hard to beat the $1.99 price tag at Christianbook.com on The Bible and The Land, by Gary M. Burge. (112 pages, softcover, mentioned previously here; $10 at Amazon). 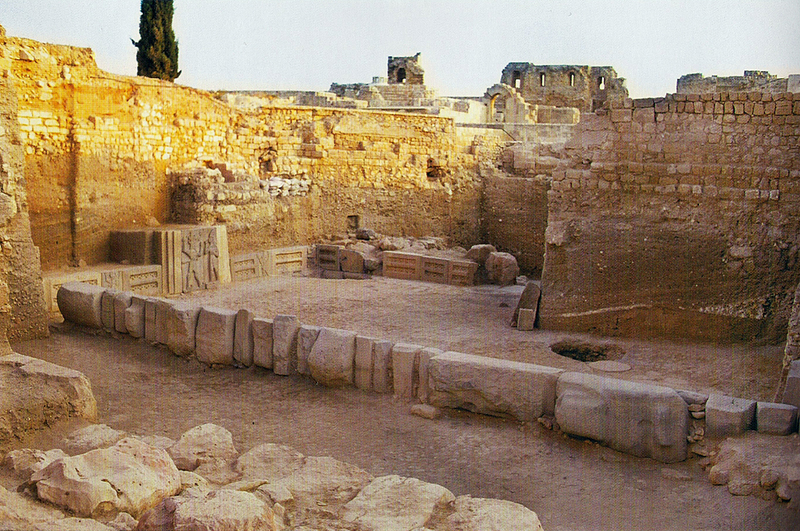 Since 1996, Kay Kohlmeyer has conducted excavations at the storm-god temple atop the citadel of Aleppo. Aleppo Storm-god Temple (Gonnella, Khayyata and Kohlmeyer 2005: 112). In 2003, a Hieroglyphic Luwian inscription was discovered in the temple which belonged to a king named Taita. We first mentioned the inscription last March. Now, full publication of the inscription by J. D. Hawkins has appeared in the latest issue of Anatolian Studies (vol. 61 : 35-54). The inscription is in the Hieroglyphic Luwian script and is designated ALEPPO 6 (there are other Hieroglyphic Luwian inscriptions from the temple, some also by Taita). The 11-line inscription is positioned behind a relief of Taita who faces the storm-god. 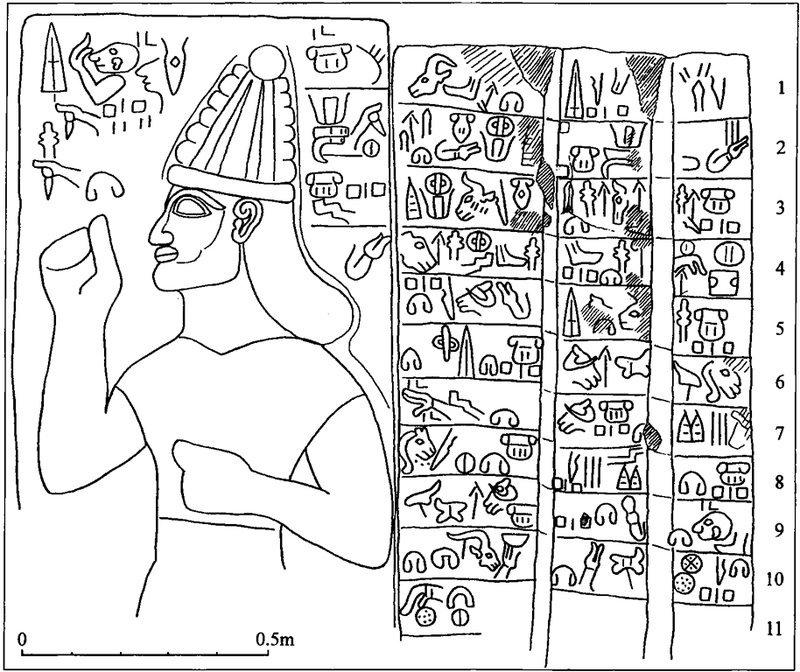 Relief of Taita with Hieroglyphic Luwian Inscription (Kohlmeyer 2009: 198). The text of the inscription names Taita, the king of Palistin, and mentions his honoring the image of the storm-god of Aleppo. The majority of the inscription is given to ordering the kinds of offerings that should be brought, depending on whether (1) one is a king, prince, country-lord, or river-land lord, or (2) one is a lower-level ruler of some sort. Drawing of ALEPPO 6 (Hawkins 2011: 42). 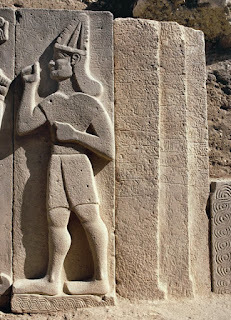 In our first post, there was a brief discussion of an article by Charles Steitler, in which he suggests identifying Taita with Toi/Tou, the king of Hamath mentioned in the Bible (2 Sam 8:9-11; 1 Chr. 18:9-11). At this time, there are three issues which make it hard to know for certain if Taita is Toi/Tou. First, it is hard to say why the additional -ta element at the end of Taita would have dropped off. Steitler identifies this element in other Hurrian personal names, but as far as I understand, it is not known for sure what it means, and if we do not know what it means, then we cannot explain why it would be lost. Second, Steitler suggests the shift in vowels from a to ō can be explained by the "Canaanite shift," but this shift is thought to have taken place in the 14th century B.C., long before David, Toi/Tou, 2 Samuel or 1 Chronicles. (A friend has pointed me to an article by Joshua Fox  which discusses a similar Phoenician vowel shift, but it is not clear to me how Phoenician would explain the change when moving from Luwian [or Hurrian] to Hebrew.) Third, Hawkins originally dated Taita to 900-700 B.C., and later adjusted this to sometime in the 11th and 10th centuries B.C., so pinning down the date is an issue for whether Taita could be Toi/Tou. But now, with the publication of ALEPPO 6, this last question concerning chronology has taken a new twist. In the new article by Hawkins, he makes two modifications to his previous historical reconstruction. First, he is more confident about dating Taita to ca. 1200 B.C. (11th century B.C.). 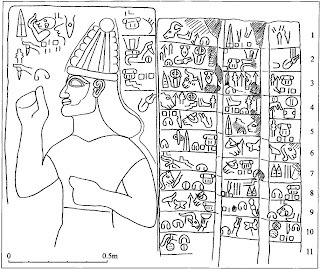 This date is reached on the basis of (1) archaic features noted in the paleography of the ALEPPO 6 inscription, (2) radiocarbon dating of the storm-god temple phase associated with Taita, and (3) stylistic comparison of the sculptures from the Taita phase of the storm-god temple with the sculptures at the temple of 'Ain Dara. Second, the archaic features in the ALEPPO 6 inscription indicate it is earlier than the other Hieroglyphic Luwian inscriptions connected with Taita which were found at Shaizar and Muhradah (about 13 miles northwest of Hamah, Syria). Hawkins suggests the possibility of two kings named Taita: Taita I and Taita II. But because the inscriptions of Aleppo, Shaizar, and Muhradah share many similarities—Taita's name and title, and unique epigraphic features—Hawkins believes that Taita I and Taita II were separated by perhaps not more than a single generation, with Taita II possibly being the grandson of Taita I. Thus, Taita I who was responsible for the Aleppo inscription would have ruled in the 11th century B.C., and Taita II would have ruled in the early 10th century B.C. It will be interesting to see how the historical picture continues to change as more information is obtained from excavations and studies, and then, what light this might shed on the time of David and our understanding of biblical history. Gonnella, Julia; Wahid Khayyata; and Kay Kohlmeyer. 2005 Die Zitadelle von Aleppo und der Tempel des Wettergottes: Neue Forschungen und Entdeckungen. Münster: Rhema. 2011 “The inscriptions of the Aleppo temple.” Anatolian Studies 61: 35-54. 2009 “The Temple of the Storm God in Aleppo during the Late Bronze and Early Iron Ages.” Near Eastern Archaeology 74/4: 190-202. Probably every tour guide who visits the site of Qumran makes note of the fact that a portion of every Old Testament book was discovered in the nearby caves with the exception of Esther (given that Ezra-Nehemiah were a single book). You may have heard a suggestion or two offered for this lack, but I found helpful a summary of possibilities given by Sidnie White Crawford in her article on the Book of Esther in the Encyclopedia of the Dead Sea Scrolls (1: 269). 1. The fact that no fragments have been preserved is simply owing to accident or chance. The book is relatively short and may have been in existence in the community but simply not preserved or discovered. 2. The male community at Qumran was not interested in a book in which the hero was a female. 3. The Qumran community was opposed to the book which describes a Jewish woman marrying a Gentile king and not following the Jewish laws. 4. The book of Esther was not known in the land of Israel in the first century. 5. The book was written too late to be included in the body of sacred scrolls. I would be inclined to believe that because of #2 and #3, #1 is true. It may also be observed that the book of Esther is never quoted in the New Testament, nor is Purim mentioned. Two people with the name Mattaniah are mentioned in 1 Chronicles 25:4, 16 and 2 Chronicles 29:13. The full press release is here. Leen Ritmeyer comments on the location of the find. Joseph Lauer passes on word that some information in the press release is incorrect. According to Zachi Dvira (Zweig), “This was not sifted at our site. And the visitors sift only the debris from the Temple Mount. Only our staff workers do the sifting for other excavations." Mattaniah seal. Photo by Clara Amit, courtesy of the Israel Antiquities Authority. What can archaeology prove or teach us about the Bible? What are its limitations? BW: Archaeological findings have revolutionized our understanding of the Bible. Through the discoveries of archaeology, we have ancient texts that help us better understand the original languages of the Bible as well as the world of the Bible. The people, places, history, religion, and material culture of the Bible are much better understood as a result of archaeological finds. Many finds are limited in that they are “silent,” and have to be interpreted. This leads to a variety of understandings by various scholars. TB: Archaeology illuminates the world of the Bible. The Bible was written to a contemporary audience, who didn’t need an explanation of what a house looked like, how a city gate functioned, or what types of tombs people were buried in. Its original readers knew all of this and much more. But today we live in a different world and culture, and archaeology helps to bridge the gap so that we can more properly understand the context in which the Bible was written. Archaeology cannot prove the Bible as a whole, but it can support and confirm the Bible’s records of events. Some people today think that the Bible was a myth written hundreds of years after the events it purports to describe, but archaeological evidence reveals the names of people and places that confirm that the Scriptures were written by first-hand witnesses. Archaeology cannot prove many aspects of the text, such as the faith of the people or the supernatural work of God. Furthermore, archaeology has a significant weakness: All discoveries are subject to a human interpreter, who is fallible. Many archaeological discoveries have been misinterpreted, both by those who believe the Scriptures and by those who deny them. This is the nature of the discipline of archaeology, and believers should not place too much confidence in the discoveries of archaeology per se because of the ambiguity involved in much of the evidence. The full article is here. Now where’s my bullwhip?